Zachary Lozano is the new Gasparilla Island State Park manager, but he is certainly not new to Boca Grande. Zac worked at the park several years ago before advancing his career in several other parks around the state. He started out with Florida State Parks in 2011 as a part-time ranger at Cayo Costa State Park, and soon after that he was promoted to a full-time ranger. He eventually became a resident ranger and lived at the park. There are currently two resident rangers and an assistant manager who live at the park. 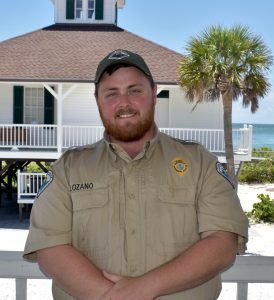 After spending two years at Cayo Costa, Zac came over to Gasparilla Island State Park as the park service specialist, serving Cayo Costa State Park, Don Pedro State Park, Stump Pass Beach State Park and Gasparilla Island. He held that position for a year and was promoted again to assistant park manager at Sebastian Inlet State Park at Indian River Lagoon Preserve on the east coast of Florida. “I wanted to learn more and advance in my career, so I accepted that position,” he said. “Half the park was in Brevard County and the other was in Indian River County near the town of Melbourne,” he said. Being the assistant park manager, he oversaw the field operations and learned the necessary skills to be promoted to the next level. “Sebastian Inlet State Park had a huge campground, and they were open 24 hours a day. They had two ranger stations with staff at both locations,” he said. The park had two museums, a full-service marina, a full- service and a primitive campground, two large fishing piers and a concession building near the water. Zac was there for two years, living onsite at the park. He was promoted again to park manager at Delnor-Wiggins Pass State Park in Naples. After working for a year in Naples, the parks manager position opened up here in Boca Grande. Zac is originally from, Layton, Florida, a city on the island of Long Key in Monroe County. “It’s so small that you can drive in and out of it in just a few minutes,” he said. His parents, Ray and Sandra Lozano, moved to Punta Gorda with their sons in 1999, so Zac became familiar with Charlotte Harbor very quickly. Ray was a commercial fisherman in the Keys, which is where Zac learned his appreciation for nature. In 1998, Hurricane George wiped out his dad’s commercial crabbing business, and the family decided to move to Punta Gorda. After high school, Zac attended Edison State College and earned an associate degree in general studies. When an opportunity arose to work for the parks system at Cayo Costa State Park, he decided to pursue a career as a ranger. His mom was originally from New Jersey, and his dad was from Miami. Sandra’s sister was living in the Florida Keys on the same street as Ray, and that is how they met. Zac has one older brother, Aaron, who is a family physician in the northeast Tampa area. His uncle is a retired ear, nose and throat doctor. Growing up in Charlotte Harbor and working at local parks made the transition to his current position a natural fit. As a former park specialist here, he worked closely with the Barrier Island Parks Society and has a good working relationship with Sharon McKenzie, executive director for the organization. “Barrier Island Parks Society is amazing – it’s a very successful, strong organization … I am very excited to be back working with them,” Zac said. He noted that the park manager role is unique, and running Gasparilla State Park is just one part of the job. He attends meetings regularly at the three other parks. Stump Pass State Park is in the process of starting up a “Friends” group, which is a citizen support group that works together to maintain the park as well as update the amenities available. His duties as park manager vary from day to day, depending on the types of projects that need to be completed. He also works to secure grants for various projects that need funding. Zac is also the FWC permit holder for the sea turtle nesting season. Park Service Specialist Robert Longo was recently promoted to assistant park manager at Wekiwa Springs State Park in Apopka. His last day in Boca Grande was two weeks ago. Zac’s fiancé, Taylor Smith, is an environmental specialist at Charlotte Harbor Preserve State Park. They met while working together at Sebastian Inlet State Park. Zac and Taylor live at the south end of the island. They have two dogs that they walk every evening. One is a Lab named Drake, and one is a little mixed mutt named Rider. “I like living close to the park, because I feel I can stay connected to what’s going on all the time,” he said. When he is not working, Zac enjoys fishing, backpacking, hiking and camping. He and Taylor like to spend their free days exploring other state and national parks. Zac also likes to partake in competitive red fish tournaments. He enjoys fishing for tarpon but has not competed in any recent tournaments. Zac said park staff members are crossing their fingers that 2018 will be an uneventful hurricane season, so they can use the summer months to get caught up on projects. Look for Zac and Taylor walking around the island during the evenings with their pups, Drake and Rider.